26/48 Les Winan Jamie Foxx's superlative performance saves a movie that would otherwise be a too-bland, cable television quality biopic. 30/126 Kim Hollis Jamie Foxx's performance and this music make this totally worthwhile. 34/55 Reagen Sulewski Foxx brilliant, the rest, not so much. Scenes here and there pop off the screen, but otherwise this is VH1 material. We have all used the quip about a bad referee: "Who let Ray Charles officiate?" The universality of the joke is due to the popularity of the artist himself. The man behind the punchline is after all one of the most inspirational success stories of the last century. A blind black man raised in the south during a period of racial segregation, the musician overcame all obstacles to become a legend in his industry. 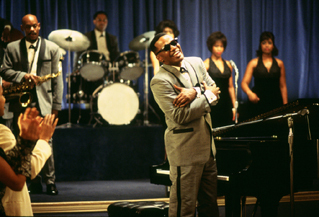 Ray is a biopic about the life of the legendary Ray Charles starring Collateral's Jamie Foxx in the title role. Soul/country and western singer Ray Charles was raised in Albany, Georgia. By the age of six, glaucoma had caused him to go completely blind. His mother was unprepared to deal with such challenging parenting circumstances, and she sent him away to a special school for the blind soon after. As a result, the young musician had to learn to survive and excel on his own, skills which would later prove important to Charles when his mother's death left him an orphan at 16. The period leading up to his 21st birthday saw the blind man grow in stature in the music industry thanks in large part to his preternatural ability to mimic other successful artists. That year (1951), he scored his first top 10 R&B hit with Baby, Let Me Hold Your Hand. In the next decade, Charles grew in stature as he began to develop his own sound. Along the way, though, he developed a reputation as being harder to work with than the other talent at his label, Atlantic Records. Eventually, these clashes led to his signing with competing label ABC Records and his difficulty in dealing with music execs will be a major plot line in the movie. Soon after Ray Charles signed on with ABC Records, his career hit a crescendo in 1960 with the release of the masterpiece Georgia on My Mind, his most lasting hit. He won a Grammy for Best Male Pop Vocal for this effort and also picked up Best R&B Performance the same year for Let the Good Times Roll, his last Atlantic recording. In 1962, he reached new heights with I Can't Stop Losing You. It was his first true country and western output, a matter of significant surprise to the rest of the music industry. Many of them had forgotten that he was still at heart a Georgia native country boy.